Redeeming your ground. It’s an interesting concept. And one we’ve all likely consciously or subconsciously thought about at least once. Taking back an untamed space and making it your own. For Doug and Brittany Scott, the featured guests in this inspiring episode, that’s exactly what they did, and then some. As you’ll learn from their story, Doug left the comfort and security of a cushy corporate job to answer the call of his passion and vision. Fortunately, Doug’s wife Brittany was not only in full support of this bold step, she jumped in with both feet to add her complementary skills and gifts too. Today, Redeem Your Ground is a growing outdoor design studio and popular lifestyle blog. We could say so much about their story here, but it’s much better to watch them tell it. Doug and Brittany, along with their two amazing young daughters, live life to the fullest, outside as much as possible in their own backyard, and welcome the opportunity to share their space and story with others too. And one more thing—Doug and his family are part of our family here at Growing a Greener World. Doug has played a significant role in helping us in his position as Consulting Director of Business Development. 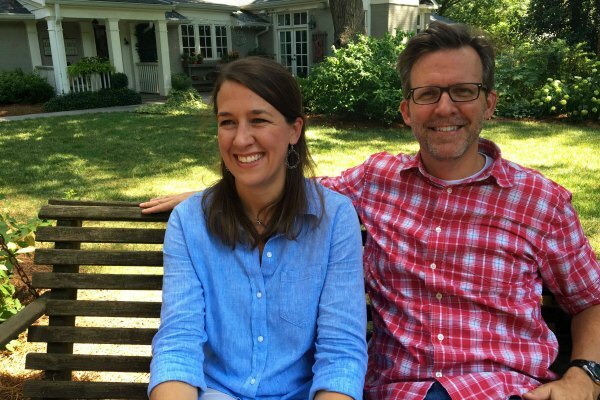 We hope you enjoy Doug and Brittany’s story as much as we enjoyed creating it for you. Just saw Redeeming Your Ground & liked the wine bottle tiki torch. You mentioned that we should be able to buy the cap with chain, for snuffing out the flame. Any suggestions where to find them? I did a quick search online, and only found them with kits that include everything except bottle and fuel. Hi Lisa. I found the caps and chains on Amazon and purchased them there. It’s been a while so I don’t remember how I found them but I would think searching for tiki torch caps, (or add with chains), but I didn’t do that since I didn’t know that was an option. Wine bottle torches instructions please episode 805 I missed part of instructions .i so your shows and watch all the time . Lorraine, Here is a link for the instructions for the Tiki torch bottles. http://redeemyourground.com/declaring-war-on-mosquitos-diy-wine-bottle-tiki-torch Thanks for watching and have a great season in the garden. Thanks, Erica, but all the links (the wine bottle torch and the actual redeem your ground website are not showing. There an error notice. Sorry you received an error notice.The links appear to be working now. http://redeemyourground.com/ and for the Tiki torch wine bottle, here is a link.http://redeemyourground.com/declaring-war-on-mosquitos-diy-wine-bottle-tiki-torch Happy gardening! Awesome Shari! Love this comment. So glad you are able to watch it now. Thanks for sharing this great story! Look at you being all “pinteresty”! Love it. I love this story. The evolution of the property and the family growth was intertwined. It brings back memories of an earlier time for me when I was likewise. I need to get back in harmony with living in the outdoors. Hard to do here in Iowa when we are cooped up for almost 6 months. Much to think about Joe. Thank you gif this inspiring story! Loved this episode! Just worked in my own yard all day yesterday and this gave me the desire to follow through with some of the ideas that were just in my head but need to be put into action. Look forward to more episodes! I would like to see an episode about the Hmong people and their gardens in New Orleans. This is exactly what I needed to see to get motivated in my yard. For almost 30 years, my yard has been an eyesore, but your program is giving me hope that I can have a great yard. Joe, I truly appreciate what you do to inspire an average gardener like me. Thank you David. So glad you enjoyed. Gardening is all about new discovery and the sharing of ideas and inspiration. Sounds like we hit the mark for you and that makes us very happy! Good luck as you work to “finally” redeem your ground too. Awesome episode!!! What a beautiful story and family! I got some great ideas from his backyard and I love the tiki torch idea! Yay!! You’re gettin’ better n bigger all the time! I will tell my friend, Cecilia.. (‘yawl’ met her at our place!).. to add this to her info too! Keep diggin’! Great story, what a wonderful way to raise your children. Thoughtfully presented. I also liked the wine bottle tip. I’ve been using them for torches but I never thought of adding the gravel for stability. Joe, this episode was wonderful , just as all the others! Keep up the great work , we love it! Leslie, thanks for the kind words. It was great to work with Joe, Carl, and team…and such an honor. I agree…we love Growing a Greener World too!!! WOW !! What an AWESOME Family !!! Thank You for sharing ! Tiki torches with my Gardening group on Sparkpeople ! Awesome Patti! So glad you liked it and thanks for sharing!